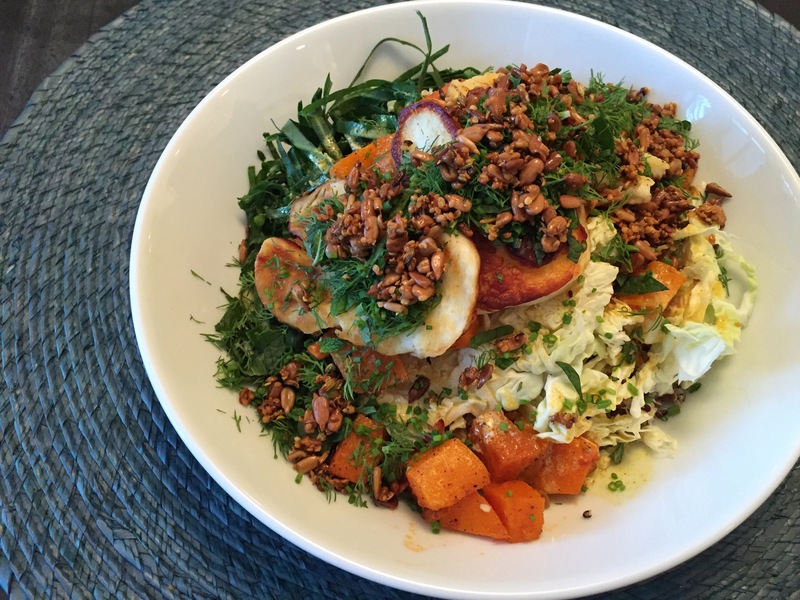 I found this recipe in the February 2015 issue of Bon Appetit and couldn’t wait to make my own Dream Bowl creation. Rather than a traditional recipe, this is more of a guideline to help you create the concoction that best suites you and your flavor profile. Below is the breakdown with suggestions and ingredients to consider. I roasted my sweet potato and butternut squash in harissa and loved the flavor it added. A little spicy but not too much. Enjoy! What’s even better than a bed of delicious cooked grains? A duo! We like black rice with red quinoa, farro with red rice, bulgur with freekeh, or spelt with lentils (okay, so that’s a legume—see how crazy this can get?). Before you prep the other toppings, thinly slice heartier greens—e.g., kale, collards, savoy cabbage—then toss with apple cider vinegar to moisten and give them a few squeezes. They’ll be tenderized by the time you’re ready to assemble the bowl. 1. Use the leftover seed-toasting oil to griddle some sliced Halloumi cheese (our new favorite—don’t tell feta). 2. Dress up your grains with a generous handful of tender chopped herbs, such as mint, parsley, chives, and fennel fronds. For the ideal crispy-creamy balance, cut winter squash, carrots, or sweet potatoes into bite-size pieces, then toss with olive oil, salt and pepper, and a dab or two of harissa or a shake of curry powder. Roast at 425° until tender. Bold is better. For our Turmeric-Tahini Sauce, whisk together 1/4 cup tahini, 3 T fresh lemon juice, 2 T olive oil, 1/2 tsp ground turmeric, 1/4 tsp cayenne pepper, and 1/4 cup water until smooth. Add salt and pepper to taste of course. Pour liberally on pretty much everything. Don’t toss—at least not before admiring your work. Separating the components lets you design perfect bite after perfect bite.